O.ME.R provides interior systems and components in light alloy and composite materials for railway vehicles. The company is accredited by the main European railway operators and worldwide rolling stock manufacturers, such as Ansaldo Breda, Bombardier Transportation and Alstom. O.ME.R uses mixed materials such as light alloy and composites, in order to improve noise reduction, to avoid ‘cold touch’ and reach weight reduction. O.ME.R is constantly dedicated to the research and development of new technologies, in order to maintain shapes and geometry of rail cabin interiors, according to the clients’ choice of design and requirements. The company aims to speed up the manufacturing process in terms of tooling and tooling settings, and consequently to optimise costs. 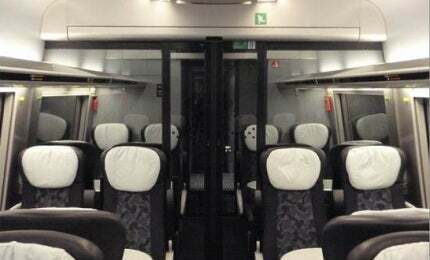 A number of recent contracts awarded to O.ME.R include special area interiors and rail fairings for ETR 1000 – Zefiro (Ansaldo Breda – Bombardier), passenger area interiors and vestibule ceilings for Regio 2N (Bombardier), complete interiors for Vivalto Double Decker (Ansaldo Breda), and complete ceilings and endwalls for Xtrapolis Melbourne (Alstom). O.ME.R was founded in 1990 and is based in Italy. With more then 130 employees and a total turnover of €19m in 2014, O.ME.R’s engineering department uses advanced software, and company project engineers are available to work onsite. A fully integrated in-house production cycle consisting of two laser-cutting machines with automatic master lift, presses, drilling machines, bending machines and three painting shops, enables the full monitoring of the process and consequently the cost controlling process, reactivity and flexibility. O.ME.R has also reached the most stringent qualifications and certifications required from the railway market, including International Railway Industry Standard (IRIS), ISO 9001: 2008, EN 15085/2 and DIN 6701.